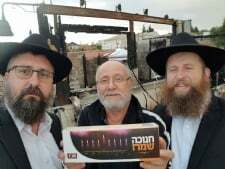 Immediately upon returning from the convention of Chabad Shluchim in New York, Rabbi Menachem Kutner, Director of Chabad’s Terror Victims Project (CTVP) and Rabbi Yosef Yitzchak Freiman, Shaliach in Zichron Yaakov, began visiting families in that area who have been impacted by the terrible fires that raged everywhere. Fires that are the newest weapon in the terrorists’ arsenal of violence. This is just the beginning as Rabbi Kutner will be going to all the families and, with the help of the Shluchim in the Chabad Houses in their areas, will bring relief efforts to all the suffering families. 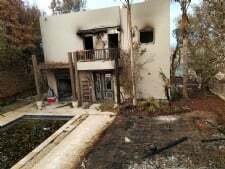 Rabbis Kutner and Freiman sat with several families the first day, listening to their stories and assessing what their immediate needs are so that they could provide not only emotional comfort, but replace the basic needs lost in the fires. In one home the father was distraught. 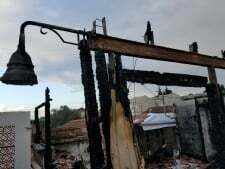 His tallis and tefillin had been burned and there was no trace of them. Rabbis Kutner and Freiman left and returned a short time later with a tallis, tefillin, a set of Jewish books, and a tzedakah box. The father was overwhelmed with gratitude, tears falling from his eyes. In another home, it became clear immediately that the family could not remain there, there was too much damage. CTVP arranged to have them moved to another apartment. Rabbi Freiman invited them to come to all the Shabbos meals in his home. One of the items this family lost in the fire was their washing machine which is critically important for a family with children. The government would eventually cover the cost of this, but it could take three months, so Rabbi Kutner told them not to worry. CTVP would provide one for them right away. In another home, Rabbi Kutner said, it was eerie. The ground floor, which had mezuzahs on all the doorposts, was not damaged. The top floor, however, where there were none, was totally destroyed. CTVP is helping this family with basic needs now, and once the repairs are done, will provide them with new mezuzahs for the top floor. We will keep you updated as Chabad’s Terror Victims Project (CTVP) and the 300 Chabad Houses across Israel move forward in relief efforts – efforts only possible through your partnership and generosity. Thank you. 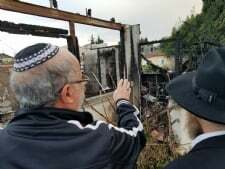 To make an emergency donation directly to Chabad’s Terror Victims Project, go to ctvp.org/fire.